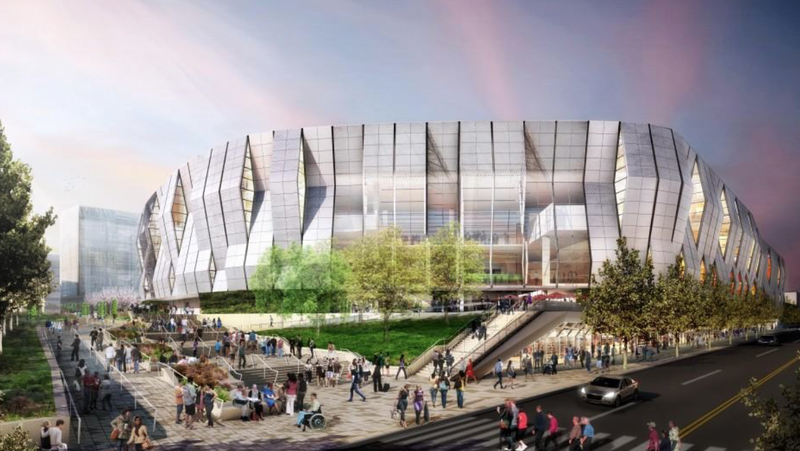 October means the the start of the NBA season is less than a month away and so we start today’s GSB News & Notes with the news that Sacramento’s Golden 1 Center, the new, state-of-the-green-art home of the NBA’s Kings became the world’s first LEED Platinum arena. We then shift to the world of Formula E, the open-wheel series featuring only electric cars, and its announcement that its Grand Prix races, or ePrix, will be coming to Brooklyn next year. 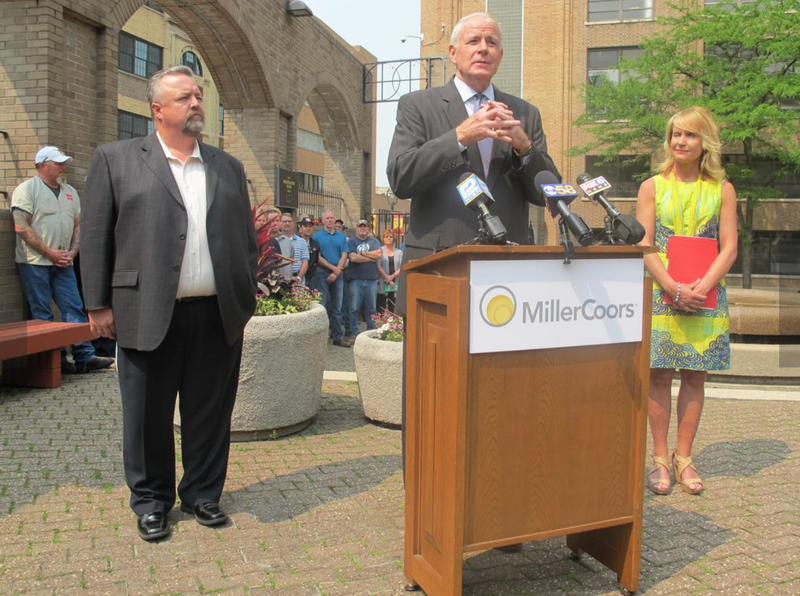 And we close with the news that leading sports advertiser MillerCoors has gone landfill-free at its major breweries. GSB’s question is: Will sports TV viewers find out? Later tonight, Sir Paul McCartney will officially open Sacramento’s Golden 1 Center, the new home of the NBA’s Kings. It is fitting that Sir Paul, with, I don’t know, a gazillion or so platinum records, will break the seal at the first LEED Platinum arena in the world. Platinum is the highest level of certification awarded by the US Green Building Council, representing the top 3 percent of buildings certified. To get there, the Kings, led by team owner and Chairman Vivek Ranadivé, and arena architect AECOM had to offer championship-level commitment from the project’s inception. Indoor and outdoor by featuring five massive hangar doors above the grand entrance will open and allow the arena to use a natural cooling phenomenon in Sacramento – The Delta Breeze – to control the building’s climate efficiently. And here’s a very cool new first, at least to us: The arena will crowd-source feedback to maximize fan comfort and reduce energy consumption. And this is just the tip of Golden 1 Center’s green iceberg. Click here for a more detailed list of the new arena’s green features, courtesy Kevin Reichard’s piece in the the September 22 issue of Arena Digest. I am sure Kings fans hope the quality of the product on the court matches that of their new LEED platinum home (that’s a long shot). My hope is that more NBA (and other sports) team owners adapt Ranadivé’s green vision. If one is asked to think about New York City sports, clear mental pictures of Yankee Stadium, Madison Square Garden, Citi Field, Central Park on Marathon Sunday, and maybe even playground hoops at the corner of West 4th St and Avenue of the Americas will likely emerge almost immediately. Auto racing? Not so much. That mental photo album will now have to include motorsports when the Formula E open-wheel, electric car racing series comes to Brooklyn next July for two races for the first-ever New York ePrix as part of its third season. The races will be held on July 15 and 16 (Saturday and Sunday) on a course at the Brooklyn Cruise Terminal near the Red Hook neighborhood. Fox Sports 1 will broadcast it. 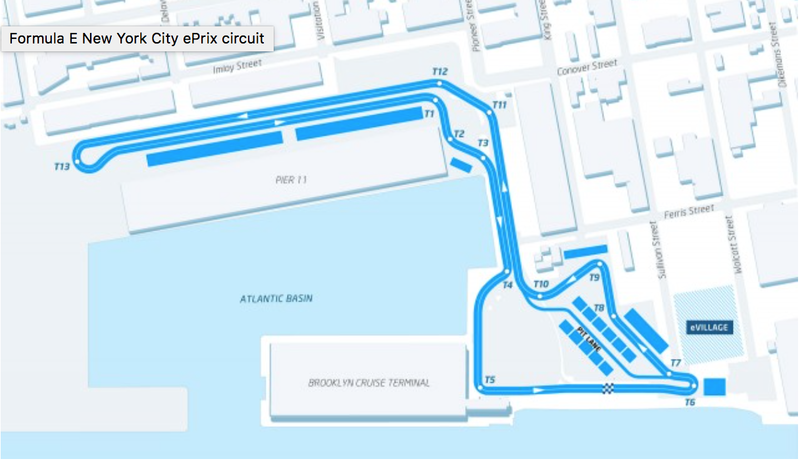 The proposed course in Red Hook, Brooklyn for next July’s New York ePrix electric car races. The entire race will be contested in the Brooklyn Cruise Terminal and not on city streets. Formula E cars look like their non-electric Formula 1 counterparts and they race at very high speeds: On a straightaway, they can reach 180 miles an hour; curvy urban courses are navigated at about 150 m.p.h. One big difference vs. Formula 1 is that there will likely be two cars for each of the 20 drivers in the Formula E races. Formula E cars cannot finish the race on one battery so each driver has two and executes a car switch mid-race. Twice as many cars per driver certainly lessens the green advantage of Formula E vs. F-1. The good news is batteries are expected to have improved so much by 2019 that the switch will no longer be needed. Even better green news: per Agag, the electricity powering the cars comes from generators fueled by glycerin from sea algae. The Formula E series has gained significant cachet in its first two years: Audi, Jaguar, Renault and Virgin among others have bought in. Former F-1 star Jacques Villeneuve is on board as are Penske and Andretti racing. Switzerland’s Sebastian Buemi, driving for Renault, is the current champion. Season 3 kicks off this weekend in Hong Kong and will visit traditional F-1 outposts like Buenos Aires, Monte Carlo and Paris before coming to Brooklyn. MILLER-COORS BREWERIES’ GO LANDFILL-FREE; WILL SPORTS VIEWERS LEARN ABOUT IT? According to a September 29 story in Environmental Leader and verified by NSF International#, MillerCoors (a division of SAB Miller), the second largest beer purveyor in the US and the country’s second largest beer advertiser, announced its eight major breweries are officially landfill free. To earn this designation, a company must demonstrate that no more than 1 percent of waste generated at a single site, including recycling vendors, goes to the landfill. Documentation and implementation of waste management and sorting processes, along with employee training are also part of the certification process. Selling spent grains, a major waste stream generated during the brewing process, to cattle farmers, which use it for animal feed. Offering waste yeast to pet food companies. Switching pallets from wood pallet to more durable and longer lasting plastic. At end of life, pallet provider Graystone Logistics grinds the plastic into pellets that are recycled and reused. To GSB, this story screams for a Public Service Announcement (PSA) for broadcast on the multitude of sports events on which MillerCoors advertises. After all, the company spent a reported $428 million on advertising in the US in 2015%, second only to Anheuser-Busch InBev’s $531 million. And, according to an August 2015 interview in Portada∞, Gustavo Aguirre, then Associate Brand Manager at Coors Light, claimed that 50 percent of company marketing dollars are spent on sports. So the company likely spent more than $200 million on sports in 2015 in the US. Beer companies have a significant incentive to show they are good corporate citizens. MillerCoors is, as is well documented, by going landfill free, a better-than-good corporate citizen. I can’t imagine that anyone is against wasting less and thus a cleaner environment. Millennials, the audience MillerCoors and every other brewer must win, are strongly pro environmental, pro climate change action. There are many polls that support this notion. Here’s just one, from ABC News/Washington Post, November 2015: 76 percent of 18‐29 year olds say climate change is a serious problem facing America; 64 percent say the federal government should do more to address climate change. If MillerCoors is, for whatever reason(s), reticent about creating and airing a Green-Sports themed PSA, GreenSportsBlog is happy to show them why it makes sense and to write the dang spot. Let’s talk! ^ We’ve laid off of the cheap puns for awhile here at GSB but this was too hard to resist. Our apologies. # NSF International verifies landfill-free programs for companies around the world. ∞ Portada is a a leading source of news and analysis on the Latin marketing and media world.